A lot of board games have been making their way over to iOS lately. Some are better than others, but most suffer from the simple fact that they were originally designed to be played with friends in the same room. Some digital games do still offer that and if you have friends to play it with that way, they can be a good, cheap substitution of the physical board game. But if you don’t, or if the games can only be played through online multiplayer, the experience can feel lacking. 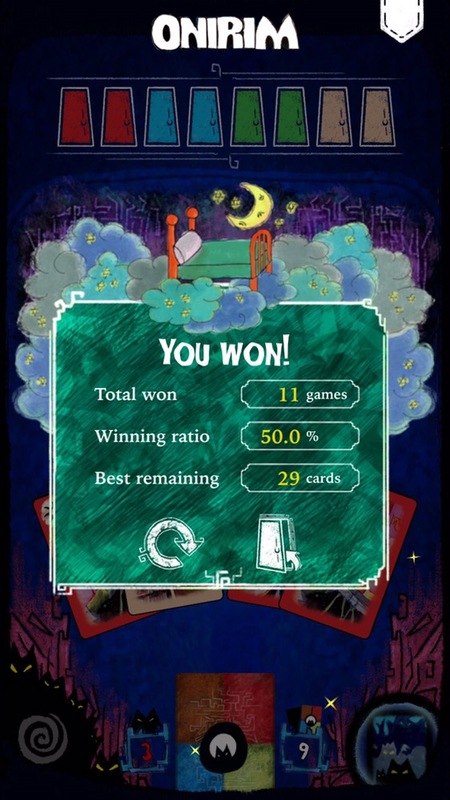 For this reason, there are few digital board (or card) games that have hooked me. I enjoyed Tsuro for a good while, and I still play Exploding Kittens every once in a while. But that’s about it. Any other digital board games I’ve tried just didn’t do it for me. 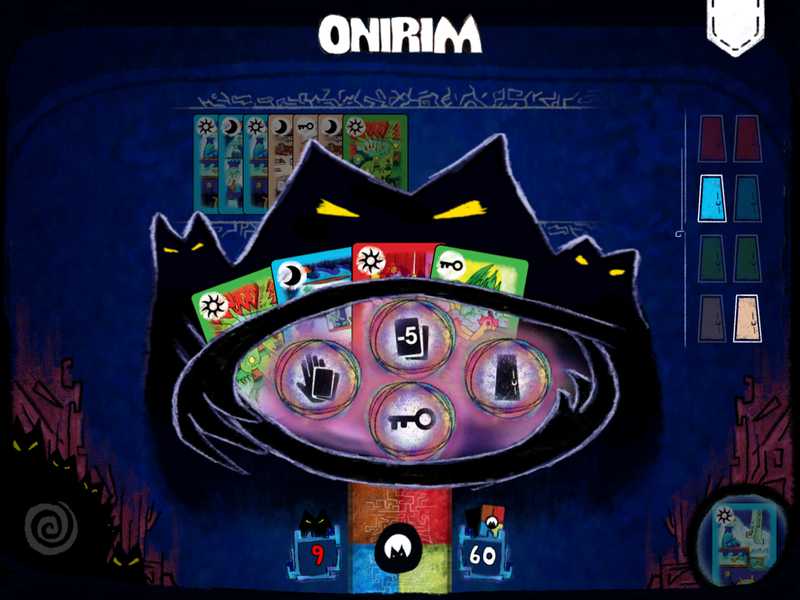 So I was a bit hesitant when I saw Asmodee Digital brought another of their games, Onirim, to iOS. But I’m glad I took a chance on it, because it’s actually a perfect fit for phones and tablets. The tutorial does a pretty good job of explaining the rules, but I’ll try to summarize them for you. Basically, you start with a deck of seventy-six cards, consisting of fifty-eight Location cards, eight Door cards, and ten Dream cards. The Location and Door cards come in four different colors. The Location cards come in three different symbols — sun, moon and key. The Dream cards consist only of Nightmares, and these are your enemies in the game. If you draw one, you’re forced to discard either one key card in your hand, your entire hand, or the next five cards in the deck. You also have the option to give up one of your open doors, but it’s rare that that would be a good move. The computer is the dealer and starts you off with five random Location cards in your hand. You play one card at a time, then get dealt another one so you always have five cards. The goal is to open all eight doors before the deck runs out. A door can be opened either by playing three of the same color cards in a row or drawing a door card while you have that same color key in your hand. The catch is that you can’t play two of the same symbol after each other. Since sun cards outnumber moons and they both outnumber keys, you have to be careful what you discard or you could end up with no way to unlock one of the doors. Normally you would discard just one card at a time to make room for another, so you can minimize the damage. But a Nightmare card can ruin an otherwise perfect game if you’re forced to dump cards you still need. There is one other trick that can help you, though, and this — together with the Nightmares themselves — reminds me a lot of Exploding Kittens. If you have a key in your hand and you think you can spare it, discarding it will allow you to see the next five cards in the deck and also rearrange them. The card that you move to the fifth slot gets discarded, and that’s the only way to get rid of Nightmares without suffering their effects first. So while there is certainly a lot of random luck involved, strategy plays a big part in the game, and it rarely feels unfair. You can see the full tutorial and a couple of games in my video below if you still don’t understand the rules. Like Exploding Kittens, each game is self-contained. There are no upgrades or unlockables to earn. There isn’t even a leaderboard. The only thing really pushing you to play again is your own enjoyment of it and a stats screen that tells you how many games you’ve won, the percentage of games won versus lost, and the highest number of cards you’ve had remaining after completing a game. Perhaps it could use something more, like a way to compete with others’ win streak. Also, right now you can delete the game and wipe your slate clean if you think you can do better. Quitting a game because it seems like it isn’t going well will count as a forfeit and a loss. So it seems like a bit of an oversight to let people delete the app to start fresh. But it’s also something most people probably won’t try to game. There’s also no iCloud sync, so your stats are split up between your different devices. It’s not a big deal, but it would be nice to see it all combined and maybe have a way to compare with others. One thing I really appreciate that so many games overlook is that it works in portrait mode on iPhone, so you can easily play with one hand. But on iPad it’s in landscape, so you can comfortably rest it on your lap and see everything with greater detail. The game also saves your spot if you quit the app in middle of a game. That means you can play for as little or as much time as you want in one shot. It’s a relaxed game with no timers, so you can easily play while waiting for the bus. Even though games normally take longer than five minutes, there’s no reason you can’t play for five minutes at a time — except that you might have a hard time putting it down. I thought I would be bored of the game after getting an extremely lucky round that ended with twenty-nine cards left, yet I’m still playing after about forty combined games. Even though I don’t expect to ever beat that, I still lose fairly often and want to try to improve my win-lose ratio. In any case, this is a game that won’t be leaving my phone, as I can see picking it up every once in a while to get a few games in. Visually, the game looks great, especially when the Nightmares attack. While the hand-painted cards are unique in themselves, the animations help bring an otherwise static game to life. It also doesn’t hurt that the music is chill, but not boring or overly repetitive. I imagine I’ll eventually get tired of it, but I haven’t yet. The whole presentation is just top-notch. The tutorial does look a little out of place with the rest of the game, but it’s no big deal since you’re not going to be looking at it all the time. I wouldn’t mind a way to fast-forward all the animations, though. They do start to feel a bit slow after you’ve played twenty or thirty games. But that’s a minor complaint that hopefully can be worked out in the future. I did read that the physical board game has seven expansion packs, while this only includes the original game. For a buck, it’s hard to complain. I already got far more than a dollar’s worth out of it. But expansion packs would add a lot of replay value and longevity to the game. Even though I’m not sick of it yet, I can’t say how long that will last. I do hope the game does well enough so we can see those expansion packs, as this is probably the first Asmodee game that I’ve truly enjoyed and and that feels at home on my iOS devices. 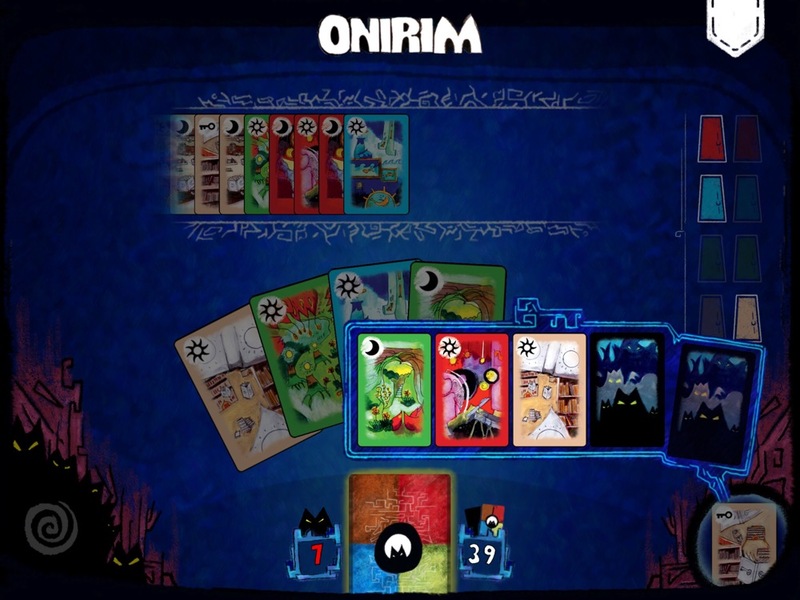 If you like card games that combine random luck with strategy and don’t feel the need for upgrades and unlockables in order to enjoy a game, you should definitely give Onirim a download here.